Barack Obama has selected Sen. Joe Biden of Delaware to be his vice presidential running mate, CBS News confirmed late Friday, balancing his ticket with an older congressional veteran well-versed in foreign policy and defense issues. Biden, 65, has twice sought the White House, and is a Catholic with blue-collar roots, a generally liberal voting record, and a reputation as a long-winded orator. Across more than 30 years in the Senate, he has served at various times not only as chairman of the Foreign Relations Committee but also as head of the Judiciary Committee, with its jurisdiction over anti-crime legislation, Supreme Court nominees and Constitutional issues. In selecting Biden, Obama passed over several other potential running mates, none more prominent than Sen. Hillary Rodham Clinton, his tenacious rival in dozens of primaries and caucuses. "This is not exactly a 'safe' selection for Obama," said CBSNews.com senior political editor Vaughn Ververs. "With over 30 years of baggage accumulated in the U.S. Senate, Biden is not the kind of running mate you would think of for someone who has campaigned on a pledge to change the way politics is done in Washington." "But it does signal that Obama may be more of a realist than his rhetoric suggests," Ververs added, "and shows that the 'change' candidate has decided that a wealth of 'experience' may be important to an administration after all." Around 3:00 a.m. Eastern time on Saturday morning, a few hours after media outlets first reported the choice, the Obama campaign sent a text message and e-mail to supporters making it official. 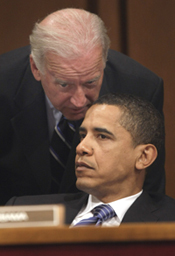 "Barack has chosen Senator Joe Biden to be our VP nominee," said the text message. "Watch the first Obama-Biden rally live at 3pm ET on www.BarackObama.com. Spread the word!" The debut for the newly-minted ticket will take place outside the Old State Capitol in Springfield, Ill., while hundreds of miles to the west, carpenters, electricians, sound stage gurus and others transformed the Pepsi Center in Denver into a made-for-television convention venue. Tucked away in one corner were thousands of lightweight rolled cardboard tubes, ready-made handles for signs bearing the names of the Democratic ticket - once the identity of Obama's running mate was known. While Obama decided against adding Clinton to his ticket, he has gone to great lengths to gain the confidence of her primary voters, agreeing to allow her name to be placed in nomination at the convention and permitting a roll call vote that threatens to expose lingering divisions within the party. "In naming my colleague and friend Sen. Joe Biden to be the vice presidential nominee, Sen. Obama has continued in the best traditions for the vice presidency by selecting an exceptionally strong, experienced leader and devoted public servant," Clinton said in a statement. "Sen. Biden will be a purposeful and dynamic vice president who will help Sen. Obama both win the presidency and govern this great country." Biden slowly emerged as Obama's choice across a long day and night of political suspense as other contenders gradually fell away. First, Virginia Gov. Tim Kaine let it be known that he had been ruled out. Then came word that Sen. Evan Bayh of Indiana had also been passed over. Several aides to Clinton said the Obama campaign had never requested financial or other records from her. Other finalists in the veep sweepstakes were Kansas Gov. Kathleen Sebelius and Texas Rep. Chet Edwards. Obama called Biden on Thursday evening to offer him the job. Michelle Obama called his wife, Jill, this morning. Among those on the short list, Biden brought the most experience in defense or foreign policy - areas in which Obama is rated relatively poorly in the polls compared with McCain. While the war in Iraq has been supplanted as the campaign's top issue by the economy in recent months, the recent Russian invasion of Georgia has returned foreign policy to the forefront. "The top advisers around Senator Obama over the last two weeks said to him, look, we need to add heft to this ticket," reported CBS News chief Washington correspondent Bob Schieffer on CBS' The Early Show Saturday morning. "Every poll shows people like you but they do note you don't have experience. 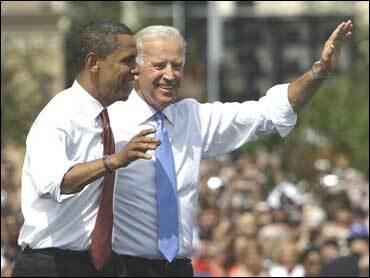 Biden adds heft to the ticket." In addition to foreign policy experience, Biden, a native of Scranton, Pa., has working-class roots that could benefit Obama, who lost the blue-collar vote to Clinton during their competition for the presidential nomination. Biden was first elected to the Senate in 1972 at the age of 29. Biden voted to authorize the war, but long ago became one of the Senate's surest critics of the conflict. Obama worked to keep his choice secret, although he addressed the issue broadly during the day in an interview. "Obviously, the most important question is: Is this person ready to be president?" Obama told CBS' The Early Show. Second, he said, was: "Can this person help me govern? Are they going to be an effective partner in creating the kind of economic opportunity here at home and guiding us through some dangerous waters internationally?" And, he added: "I want somebody who is going to be able to challenge my thinking and not simply be a 'yes-person' when it comes to policymaking." Biden spent Friday at his home in Delaware with friends and family. The normally loquacious lawmaker maintained a low profile as associates said they believed - but did not know - he would be tapped. They added they had been asked to stand by in case their help was needed. No sooner had word spread of his selection than the campaign of presumptive GOP nominee John McCain unleashed its first attack. Spokesman Ben Porritt said in a statement that Biden had "denounced Barack Obama's poor foreign policy judgment and has strongly argued in his own words what Americans are quickly realizing - that Barack Obama is not ready to be president." Early Saturday morning, McCain's campaign released an advertisement showing Biden being asked, during a Democratic primary debate, if he stands by an earlier statement that he does not believe Obama is ready to be president. "I think that I stand by the statement," Biden is shown saying. He also says in the spot that he "would be honored to run with or against John McCain, because I think the country would be better off." Biden dropped out of the 2008 race for the Democratic presidential nomination after a poor finish in the Iowa caucuses, but not before he talked dismissively of joining someone else's ticket. "I am not running for vice president," he said in a Fox interview. "I would not accept it if anyone offered it to me. The fact of the matter is I'd rather stay as chairman of the Foreign Relations Committee than be vice president." It was his second try for the White House. The first ended badly in 1988 when he was caught lifting lines from a speech by British Labor Party leader Neil Kinnock. Biden is seeking a new Senate term in the fall. There was no immediate word whether he intended to change plans as he reaches for national office. BORN: Nov. 20, 1942 in Scranton, Pa. Age 65. EXPERIENCE: U.S. senator, 1972-present; New Castle County Council, 1970-72; sought presidential nomination, 1988, 2008. EDUCATION: Bachelor's degree in history and political science, University of Delaware, 1965; law degree, Syracuse University, 1968. FAMILY: Married Neilia Hunter in 1966; three children, Beau, Hunter, and Naomi. His wife and daughter Naomi died in a car crash in 1972. Married Jill Jacobs in 1977; one daughter, Ashley. Beau Biden is now Delaware's attorney general.